In a previous post, I had talked about adoption of social media among firms in the Indian financial market. Now we look how these firms are using the social media and whether it is the right way to do social media. Indian financial market firms seem to be mainly using blogs, Facebook, Twitter, Linkedin and Orkut for their marketing activities. The firms selling trade and investment tips use the social media very aggressively than stockbroking firms. Tip sellers are using social media as a broadcast medium, they use blogs to publish their free tips on a daily basis. Most of these firms also have Twitter and Facebook accounts. On Twitter also it is mostly one-sided broadcast of buy/sell calls. On Facebook, the modus operandi seems to be to befriend possible leads and then add them to groups they had created and then post the messages to the group. Social networks like Facebook or microblogging platforms like Twitter are just two shades the social media spectrum. The picture given below should give an idea of the breadth of social media. 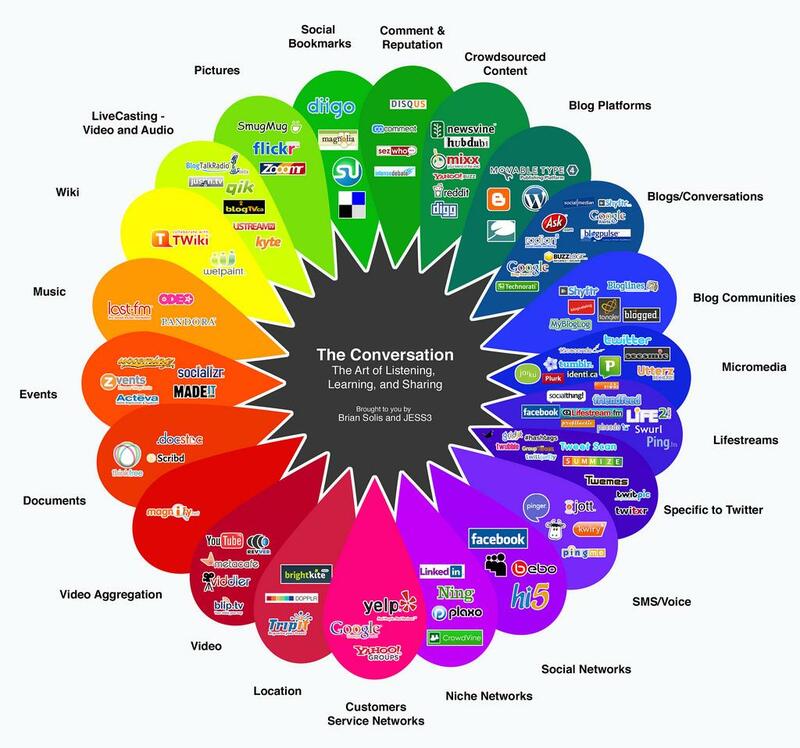 Each of the petal in the social media spectrum flower represents a way in which people collaborate and share online. Each of this is an avenue for business to engage their customers. The inherent nature of the individual media needs to be looked at when a marketing strategy is conceived. Most of the firms in Indian does not seem to get the notion of having an online social marketing strategy that is in line with the nature of the medium being used. They seem to be using ticks and techniques that worked for them in outbound marketing in social media as well. This is going to backfire create more problems than the one it indents to solve. The idea of social media marketing is to build social relationships that would make your customers talk about you with their friends and thereby the drive in more traffic and thereby generate more top line profit. Instead, firms are bombarding their customers and prospects with information that they don't care for. Soon people will realize that these firms are spamming them and they will learn ways to ignore these messages. Closing the all-important channel of communication with the customers or prospects is the last thing a company wants to do, as the saying goes, out of sight is of mind.